We see new blog owners ask the obvious question, in Blogger Help Forum: Learn More About Blogger. How do I help people Follow my blog? There are several tools for community building, or Following - and different people will make different choices, which to use. The choices depend upon the community that any blog serves - and the purposes for following. Long ago, Blogger provided a link, in the navbar, for Following. You click on the "More" pull down menu - and you'll see some social sharing links. This used to include a link to "Follow" - which provided a substitute for the Blogger Followers gadget. One of the missing selections, in the navbar menu, is "Follow" - possibly, because "Follow" means different things, to different people. The navbar menu, at one time, provided a substitute for the Blogger Followers gadget - one of several solutions for "Following". The Blogger Followers gadget lets people participate in a community network of people following the host blog. 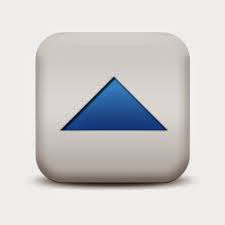 The Followers gadget provides the framework for people to surf a network of blog owners and blogs, endlessly. A second feature of the Blogger Followers following is a newsfeed subscription, added to the dashboard Reading List of the new Follower. This requires each Follower to add using a Blogger account - which may or may not be based upon an actual email address. Blogger Followers may include the option to be contacted, by the owner of the host blog, by email. It does not, however, include an email subscription to the host blog. The Blogger blog may, at the option of the blog owner, allow for commenting by blog readers. Blogger hosted comments can be published only from the host blog - unlike Google+ hosted comments. 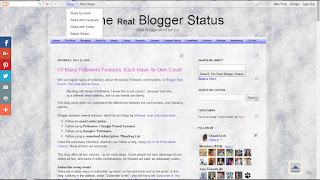 Blogger Followers is added, using "Add a Gadget", as "Followers". Be careful, and choose the gadget labeled "By Blogger" - which is, unfortunately, not easy to find! 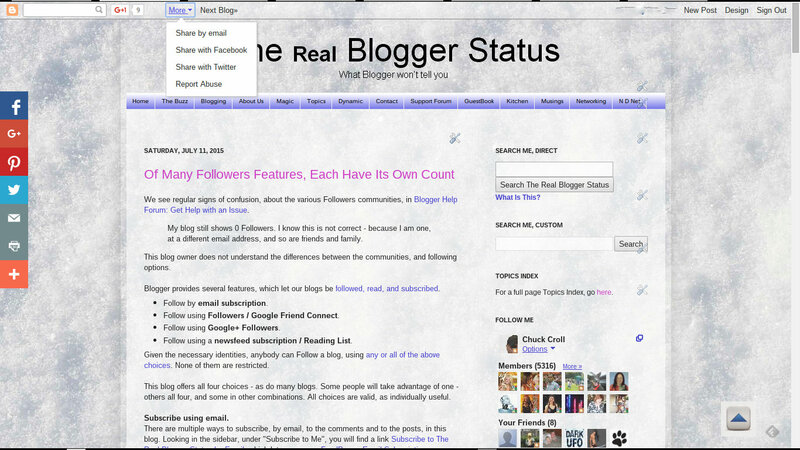 The Blogger Followers gadget, in this blog, is in the sidebar, labeled "Follow Me". An email subscription to a host blog merely lets the person following read blog posts, using email. It does not provide any commenting, or surfing, opportunity. The most popular "Follow by Email" gadget is the Blogger supplied FeedBurner Email Distribution accessory, which can be installed using either "Add a Gadget", or using code obtained in the FeedBurner dashboard. Opportunities to follow by email, in this blog, may be found in the sidebar gadgets, labeled "Subscribe To Me" and "Subscribe To" - and in the "envelope" icon, floating in the top right sidebar. A newsfeed subscription uses the newsfeed reader, chosen by the follower, to read blog posts. It does not provide any commenting, or surfing, opportunity. The most popular newsfeed reader, for Blogger blog owners, is the dashboard based Reading List. Depending upon the subscription gadget, other popular newsfeed readers can be used. A FeedBurner re published newsfeed includes the option to use several different newsfeed readers. Opportunities to follow by newsfeed, in this blog, may be found in the sidebar gadgets, labeled "Subscribe To Me" and "Subscribe To". The Google+ Followers gadget lets people participate in a community of people following the Google+ stream of the host blog owner. Similar to the Blogger Followers gadget, the Google+ Followers gadget offers the opportunity for surfing of the host blogs. The Google+ stream will include many interests of the owner - not necessarily confined to the subject of the host blog. The Google+ stream offers no newsfeed subscription - one reads the stream in Google+, a much richer medium than any newsfeed reader. I publish several blogs - and my Google+ stream includes content which reflects all of my blogs, and more. You will find my Google+ Followers gadget on this blog, on my recipes blog, and on my miscellaneous issues blog. Those 3 blogs, added together, will not add up to the widespread subjects in my Google+ stream. Most Google+ streams are similarly eclectic - although Google+ streams can be individualised, to match the audience, using Collections (for streams created by the owners) and Communities (for streams created by the members). The Google+ stream allows for commenting, on the various posts in the stream. Google+ posts associated with a Blogger blog post may be published, as comments, to the host blog - and may (not will) be visible, to the various blog readers. Google+ Followers is added using "Add a Gadget", as "Google+ Followers" (a button, plus the icon cloud) or "Google+ Badge" (just a button). The "Google+ Followers" gadget, in this blog, is in the sidebar, labeled "+Follow Me". Comments Email And Newsfeed Options. The above summary describes various posts subscription options. There are similar comments subscription options. Private Blogs Following And Subscription Options. Both the Blogger and Google+ Followers gadget can be included on private blogs - though the overall benefit is limited, because private blogs do not provide newsfeeds. There are few options available, as subscriptions, for private blogs. An almost endless array of choices are available, for community involvement, with Blogger blogs. Which ever accessories you choose, for your blog, be selective - and always choose gadgets labeled "By Blogger"! All of this adds to the complexity of possibilities, in search engine indexing of any one blog. Thanks! I got just what I needed. I've been following other blogs and now that I'm starting to tie my blog into other forums, I thought it would be nice to see who might be following me. What Access Do You Have, To Your Blog? Can I Setup A Blog, And Sell Goods Or Services? Add CSS Rules Using Template Designer "Add CSS"
SSL and the "www" alias of "blogspot.com"